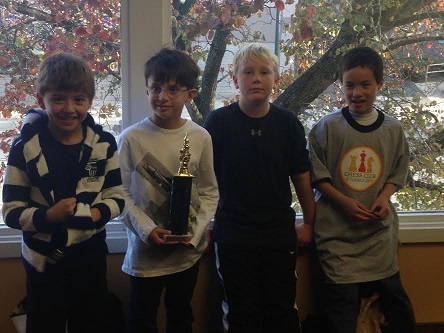 Eleven teams and 36 players participated in this fall’s K-5 Team Championships. Some of the schools had large contingents, while others were represented by individuals who bravely entered the field on their own. Although there were some experienced veterans playing, many of the participants were competing in just their first or second tournament. There were many hard fought games and the final results were still undetermined going into the last round. In the end it was the Long Ridge School that finished with 10 points, just ahead of Bi-Cultural Day School that finished with 9. As always, we are always proud of the exceptional displays of sportsmanship shown by all of the students at our tournaments. CCFC owner Melvin Patrick stressed this to the students at the beginning of the tournament with his usual words of wisdom. Not only did the children enjoy the tournament, but this time the parents also had a reason to celebrate with a free raffle that took place at the end of the tournament! Thank you to everyone who participated. We look forward to seeing you again soon!